Kingston introduced urDrive, a new tool that will turn some of its DataTraveler USB flash drives into active storage devices. 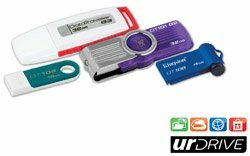 Kingston Digital, Inc., the Flash memory affiliate of Kingston Technology Company, Inc., the independent world leader in memory products, today announced urDrive, a free pre-loaded application available on a variety of its DataTraveler® USB Flash drives. urDrive transforms USB drives from passive storage to engaged, active storage, allowing consumers to easily access and organize their personal files, photos, music, games and videos. A built-in photo viewer and MP3 player makes looking at pictures and listening to music easy. "USB drives have historically served as digital couriers, transporting data from one device to another. Kingston is taking the lead in transforming the way consumers interact with those devices,” said Craig Tilmont, urDrive business manager, Kingston®. "urDrive enables consumers of all ages to make the USB Flash drive an interactive experience beyond just storing and transferring data between devices." urDrive enhances security on the PC with Norton™ PC Checkup. The diagnostic tool scans for virus infections (including spyware, worms and adware) and checks for slow performance and risks to identity and data. urDrive further enhances the digital experience with the Maxthon 3 Web browser. Maxthon 3 boasts industry-leading startup and rendering speeds, and architecture that gives users a truly portable, safe browsing experience. All temp files, history and cookies remain on the drive, keeping browsing private particularly on public computers. "Consumer computing habits have evolved and urDrive brings a new level of sophistication to mobile storage that is fresh, functional and different," said Kevin Chapman, general manager and vice president, Norton Consumer Services. "Integrating Norton PC Checkup with urDrive allows users to interact with content in an engaging way with an additional layer of security and performance analysis added to the experience. We are proud to be a part of this new evolution of active USB storage with Norton PC Checkup offering peace-of-mind to mobile users wherever they go." "Maxthon 3 offers urDrive customers a truly safe and portable browsing experience," said Karl Mattson, general manager and chief of product, Maxthon International LTD. "Now, with urDrive, your browsing history, bookmarks and settings follow you wherever you go." urDrive appeals to consumers of all ages, whether they are at work, home or traveling. For example, business professionals can easily access content at work or home and even extend storage capacity beyond the USB with free, additional online backup. The service syncs files from USB to cloud offering backup and access. For family entertainment, urDrive provides access to the latest casual game titles from EA™ Games and PopCap Games. Busy moms can rest assured that their kids can safely engage in online activities with the Fooz Kids kid-safe web browsing application. Travelers can view, manage and share their growing photo and video albums on the go, while carrying digital copies of critical documents, like passports. urDrive is available as a free, pre-loaded application on Kingston’s entry-level DataTraveler 101G2, 108 and 109 USB Flash drives, and soon on the DTIG3. These devices offer consumers a choice in design and capacity, from 4GB to 32GB.